Indulge me in a little diversion from my usual post of providing tips on creativity I’ve learned through interviews with creatives. I’d like to share a family tradition we have here of making borderline-tacky Christmas displays. 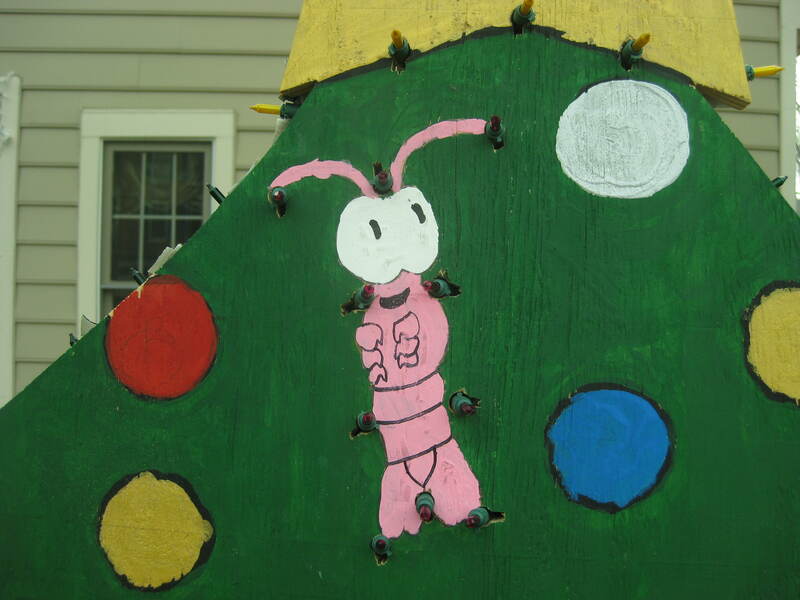 We draw them onto plywood, jigsaw them out, paint them and display them. 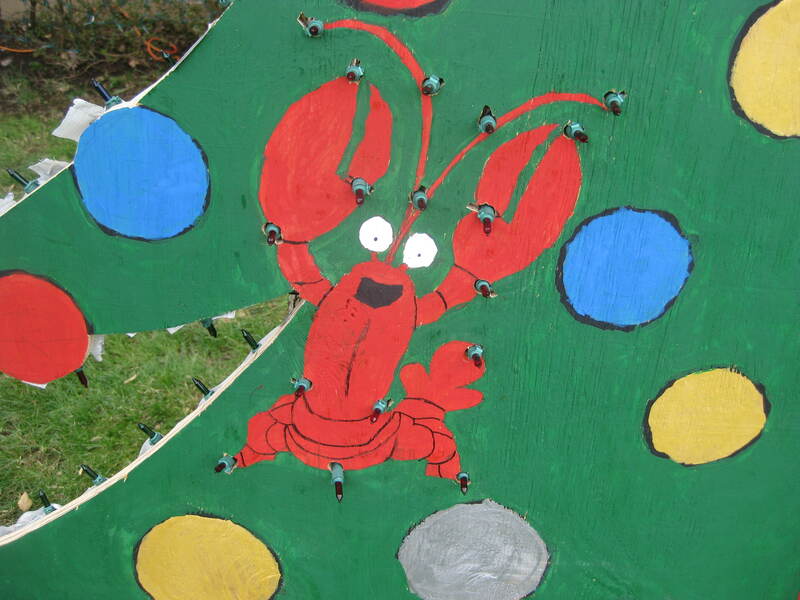 Here’s this year’s entry, a 7′ Christmas tree with four crustacean and shellfish decorations, namely a shrimp, crab, lobster, and clam. Why the seafood theme? The origin is that my wife grew up on a barrier island on the Jersey shore and likes seafood, but the fact is it’s a tradition now and so we do it without any real logic behind it. 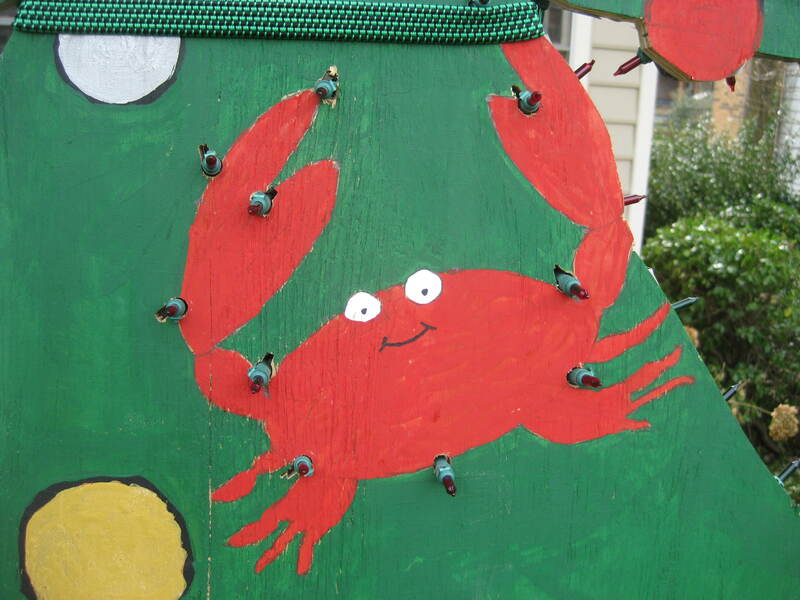 We started in 2008 with Crabby the Christmas Crab. As you can see, he’s not very crabby, at least not in mood. He also is not obviously a Christmas decoration; his wreath and bells aren’t too visible. 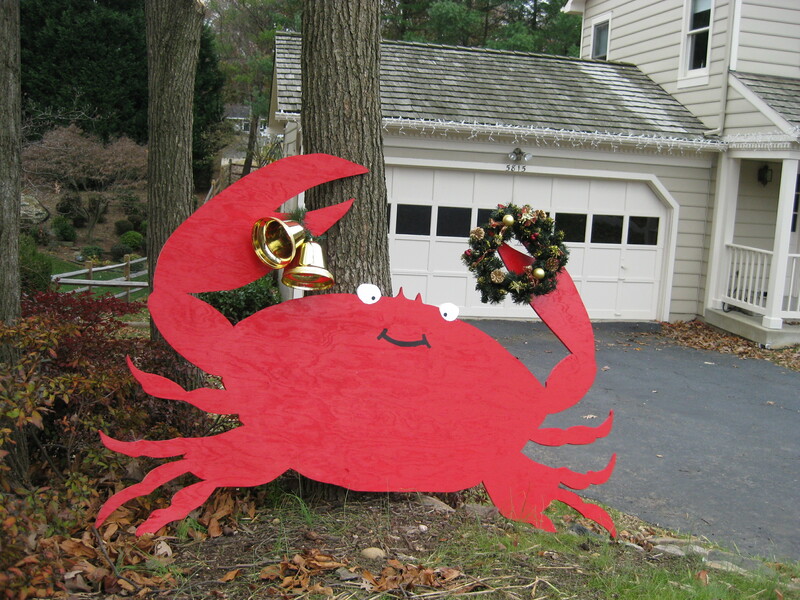 Last year I decided to keep the crustacean theme but go for something a bit more Christmas-oriented. 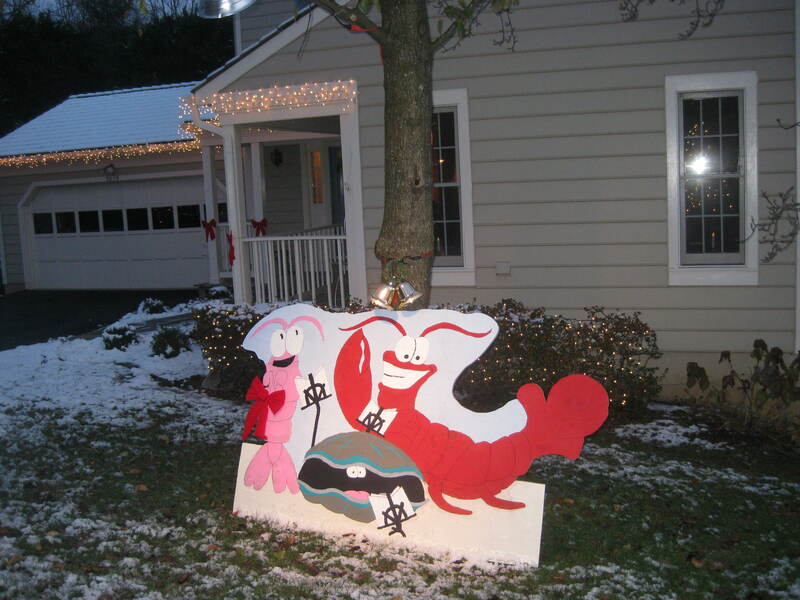 Thus the Crustacean Choir was born, our first appearance of a shrimp, lobster and clam, but no Crabby (he went on display again, on the other side of the driveway). creatures, large and out of proportion to each other. Also, note that both of these displays were lit with floodlights, which made them stand out a wee bit compared to the pretty tasteful decorations of our neighbors. This year I sought to do two new things with our Ross family project. 1) It would be an obvious Christmas theme. 2) It would not require a floodlight. This picture doesn’t quite capture it, but as you can see Christmas lights trim the edges of the tree (green on trees, the color of ornaments where one of the colored balls is on the edge of the tree, gold around the star). 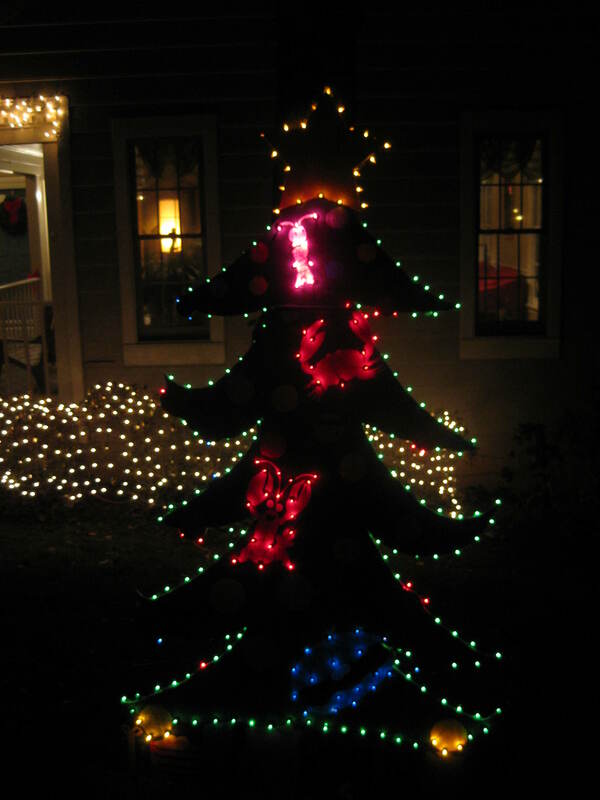 I also drilled holes in the four sea creatures and used pink bulbs for Shrimpy, red bulbs for Lobstery and Crabby, and blue lights for Clammy. Because this tree incorporated all four sea friends, we did not put out the 2008 or 2009 decorations this year, sparing the neighborhood any floods. The result of our light display is that at night, Shrimpy is quite visible and Clammy almost disappears, but the opposite effect is found during the day due to their relative size differences. I don’t consider myself a visual artist, so when I conceive and draw these displays, I go pretty simple with the drawings. My fifteen-year-old daughter, who is a visual artist, was assigned the presents at the bottom of the tree. She went all out, really putting to shame my tree! These are always family projects. All four of us participate in painting, for example. But the annual project is in fact my obsession, so I usually take the lead in developing the idea and moving it forward. No neighbor has ever told us they find them offensive, but I’m sure some do. Many have been perplexed, which is understandable, and of course we can’t fully explain them. But we have some fans, too, who were eager to see what we produced this year. The biggest fans are the kids in the neighborhood, who don’t try to figure them out, but rather just enjoy them. 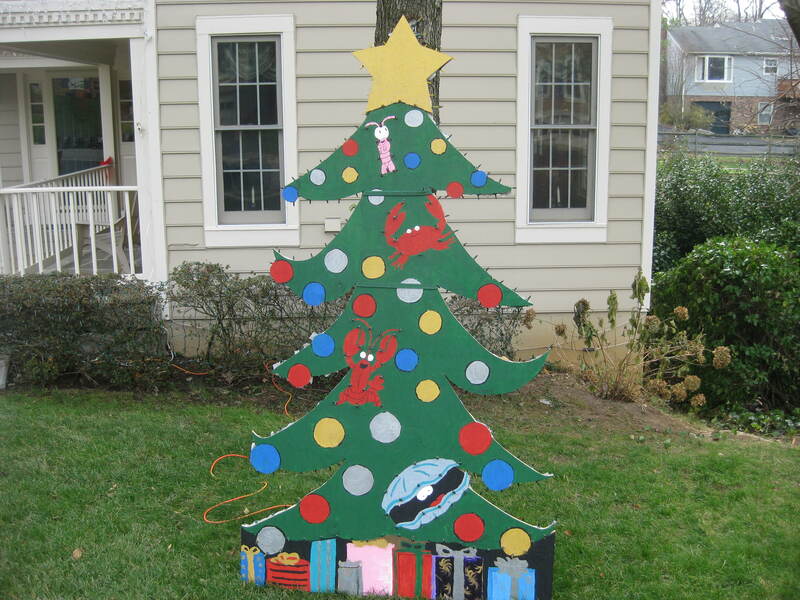 Do you have a family creative project you do during the holidays? LOL!!! No, no family traditions quite like this. But it is great fun that you do something just because it inspires you, it is fun, and the family can work on it together. What else do you need? Thanks, Amy, and Merry Christmas right back at ya! This post was not a diversion from your usual theme but a living, breathing part of it! What better demonstration of creativity than to do a family art project? I reckon that combines all the best things about creativity into one fun package. Loved all the pics. 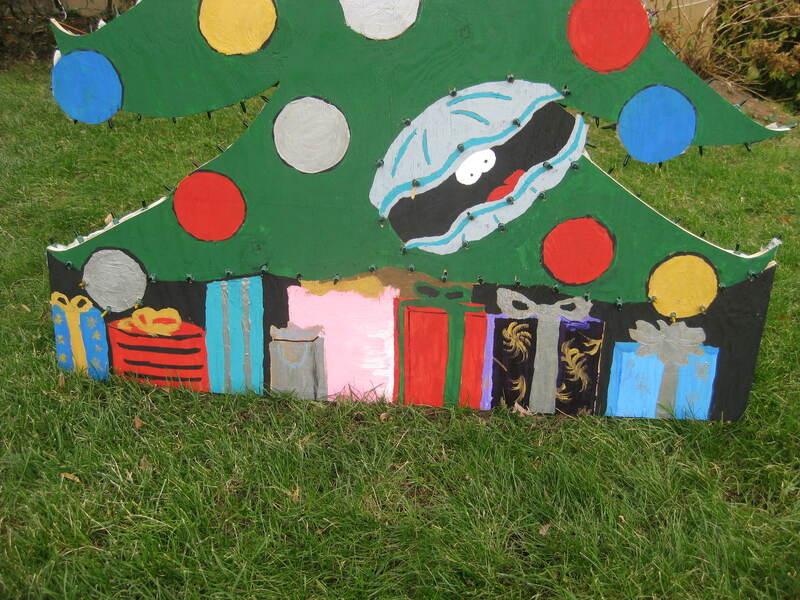 My favorite is Clammy the Christmas Clam. Thanks for taking the routine, prepackaged element out of the holidays and making it about real, homespun fun! Milli, you are so encouraging as always! 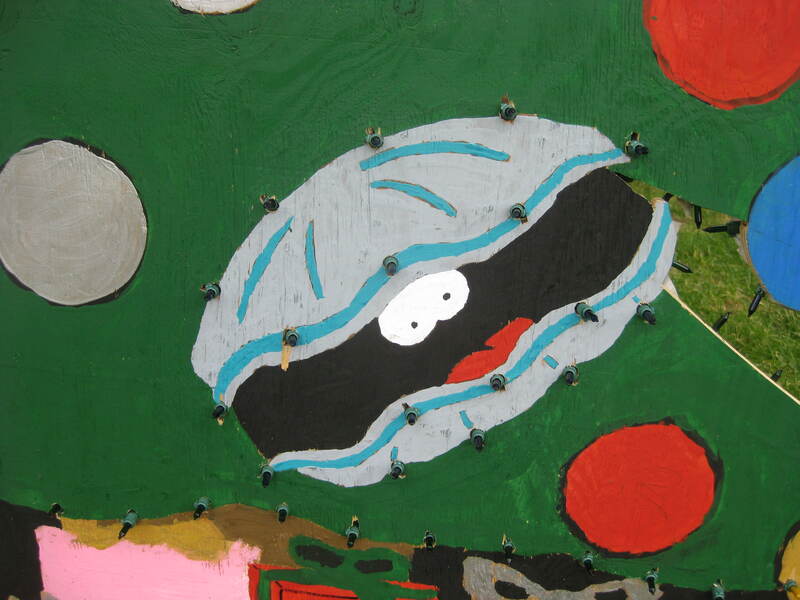 My wife likes Clammy the best, too, she was not in any way convinced a clam could be cute but I won her over. Wow, the gingerbread house idea sounds great. It’s amazing what some people have done with those, but of course it’s just as delightful to make a very simple one if it’s a family tradition. Thanks for commenting, Ollin, and have a great holidays yourself! Patrick, I loved this! How fun and original. And I agree with @fearofwriting that this is not a diversion from your usual theme but very much a great example of it. When my husband and I got married we thought of what kinds of new traditions we’d build for ourselves and what traditions we’d carry on from our families. I decided that like my mother, I didn’t want to cook turkey so soon after Thanksgiving. So in the years we are in the U.S. for the holidays, I cook from a region or country I’ve never been. So far I’ve covered Spain, the Mediterranean, and Morroco. This year I’m trying my hand at Ethiopian cuisine. Wish me luck! The other thing that emerged from our first holidays together was my baking and cookie decorating mania. That spawned a hobby gone wild. My husband and I are putting a book together which we’ll publish next year. Mari, thanks for the encouragement! It’s great that you and your husband will be taking a holiday-related hobby gone wild and helping others develop their own traditions by publishing a book! The Ethiopian cuisine sounds compelling and I do wish you luck. We experimented a bit this year with our Thanksgiving meal. Instead of a turkey I marinated game hens in lemon, butter, olive oil and spices, and grilled them over hickory chips. It was fantastic! Mari, what a great idea to cook international for Christmas. My husband and I are living far from family at the moment, so there’s just he and I for Christmas day. Neither one of us have ever been the big turkey dinner types (apart from eating it after someone else cooks it) and we both love international cuisine. I’m going to suggest your idea to him, as a fun project we can do together. Best of luck with your recipe book! We just watched Julie & Julia the other night and the passion those women had for their cookbooks was grand to watch.